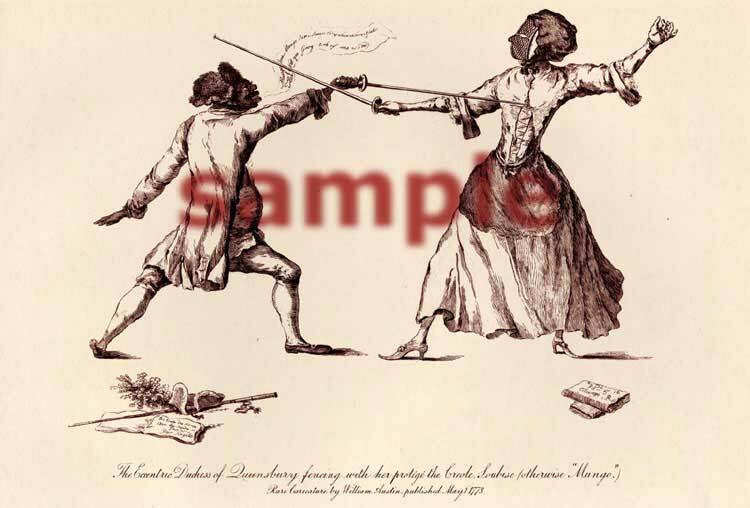 This engraving depicts Soubise imparting fencing instruction to the Duchess of Queensbury. Soubise (originally named Mungo) was the black servant and page of the eccentric Duchess of Queensbury. The Duchess sent him to Angelo’s fencing academy in London where he was trained and developed considerable skill in swordsmanship and eventually became a fencing instructor in the employ of Mr. Angelo. Unfortunately, due to his personal excesses and indiscreet behavior, Angelo was placed in the position of having to dismiss him from the Academy. Soubise was compelled to go to India where he opened a successful fencing and riding school in Bengal. Later, he was instantly killed upon falling from an extremely aggressive Arabian stallion.